Libyan leader Muammar Qadhafi addressing the summit. He along with Mbeki were the prime movers behind the creation of the African Union. "I feel a new strength, a new blood in me ... I feel that the Arab people recognise themselves in you, and that they have rediscovered their determination. Essential viewing to know the solutions to the democratic problems facing the world today - the Third Universal Theory. March 2nd, 2007 is the 30th anniversary of People's Direct Democracy Power in Libya. Scroll down to watch this prophetic video, and below it is a link to read The Green Book online. The thinker Muammar Qadhafi does not present his thought for simple amusement or pleasure. Nor is it for those who regard ideas as puzzles for the entertainment of empty-minded people standing on the margin of life. Qadhafi’s ideas interpret life as it erupts from the heart of the tormented, the oppressed, the deprived and the grief-stricken. It flows from the ever-developing and conflicting reality in search of whatever is best and most beautiful. Part One of the Green Book heralded the start of the era of the Jamahiriya (state of the masses). Part Two inaugurated an international economic revolution which does away with the old economic structures and brings them down on the heads of the exploiters. Part Three of the Green Book launches the social revolution. It presents the genuine interpretation of history, the solution of man’s struggle in life and the unsolved problem of man and woman. Equally it tackles the problem of the minorities and black people in order to lay down sound principles of social life for all mankind. The living philosophy is inseparable from life itself and erupts from its essence. It is the philosophy of Muammar Qadhafi. The Great Socialist People's Libyan Arab Jamahiriya is situated in North Africa, stretching along the Mediterranean shoreline for nearly 2,000 kilometres. Its area is 1,775,500 square kilometres making it the fourth largest country in Africa. Egypt is on its eastern border; Sudan, Chad and Niger are to the south and Tunisia and Algeria lie to the west. In a "Conversation" originally taped in 1991 Colonial Gaddafi talks primarily about his concept of Government, Economics and Social Organization which collectively constitutes his "Third Universal Theory". His ideas are largely contained in his "Green Book" which he summarizes here. This is particularly timely as United Nations sanctions have recently been lifted and Libya is very possibly posed to have a major effect on the World - particularly IF and as his ideas and those behind the organization of that society - are valid in an Historical sense! The program was not intended as a "News" oriented exercise - but rather as an opportunity for him to present to the American people - and the people of the World - his Philosophy which is unique and deserves a hearing in something other than the prejudicial terms in which most reporting about that Country has been couched. He explains the organizational schema in Libya is termed a "Jamaihiriya" - or "State of the Masses" system - which he claims is destined to become characteristic of the whole World - as an Historical inevitability! The country is divided in a large number of "People Congress's" with meeting halls established everywhere in the country where all citizens over 18 year of age are actually able to meet directly to debate and decide on policies of local, national and international concern, - and Sovereignty is theoretically vested in the People Congress's. It seems very much like the traditional New England notion of "Town Hall Meetings" - allusions to which were so prevalent in the American "political season of Ross Perot" at the time the program was originally videotaped and aired. Mr. Perot received some 20% of the National vote in 1992, and the term "Direct Participatory Democracy" is more and more a common place reference in theoretical political parlance. In practice the situation in Libya is much more complicated of course, but the idea and impetus is in keeping with the best, most progressive ideas and ideals of the modern era. The notions of Representative Democracy as advanced by America's founding fathers in 1776 must have seemed equally impossibly chaotic to the well established "Ancien Regime" Dynastic States in Europe of the time. REAL Democracy can at times seem Untidy. His ideas and the organization of the Country MAY WELL have great significance as an early and appropriate model to the World? Colonel Gaddafi also criticizes, in an interesting manner, the economic assumptions of the United States, Multi National Corporations and International Institutions such as the International Monetary Fund and the World Bank which collectively might be seen as representing a "Modern Day Ancien Regime". Technology is advancing and ushering in an era of unprecedented productive capabilities. He points out that the "Ownership" of technology is very narrowly held around the World by a very small Plutocratic ownership class - while the bulk of the worlds citizens are resigned to serve only as laborers in a system where technology, often measured as Capital Assets, is increasingly responsible for production. Echoing themes found in his "Green Book" he states in the program that "Wage earners, however improved their wages may be, are a type of Slave"..."Wage earners are but slaves to the masters who hires them". This is likely to find resonance among a great number of American as well as others around the World when and where it fully dawns that a minuscule "class" own virtual all the capital assets which are increasingly responsible for production. And even when a economic boom occurs under a so called "liberal wing" of the ruling class as occurred in the United States during the recent so called: "dot com" bubble, the system was structured in an inherently flawed manner so as to further enrich the few with preferential stock options and immoral and illegal financial slight of hand shenanigans. However even during the growth period and particularly following the bursting of the bubble as the dust settled, it was obvious that the experience had left massive numbers of the "workers" penniless - many all but destitute - while the wealthy owners pocketed millions. It might justifiably be claimed such an outcome was inherent in the system and financial assumptions about the way Capital Formation is allowed to be achieved. Enron, Worldcom, Arthur Anderson and the whole panoply of corporate and financial scandals which rocked America and the system which created them and that still goes all but unchallenged and continues to undermine confidence in the United States - was not, in other words, the result of a momentary mistake or lack of judgment here and there but intrinsic to the assumptions of and the very structure of the system itself. Despite all the "happy talk" by Sycophant and Myopic Courtesans - Sinecured Courtiers - the System itself which has held sway for 200 years and daily declares itself invincible (representing the "End of History" according to Francis Fukuyama) is struggling under the weight of it's "Inherent Contradictions" (It seems Marx May have been right about that) and is very possibly vulnerable to competition by newer more appropriate Models. Again Libya - particularly at the level of basic grounding ideas and principals - may have moved ahead of the curve? As Difficult - in practical terms as it obviously would be - Colonial Gaddafi would "Abolish the Wage System"!! There are few public road side signs in Libya but one which is very prominently and widely displayed says: "Partners Not Wage Earners". Libya seems unique in attempting to make sure those who make up an organization are "Owners or Partners" of the operation rather than merely "Wage Slaves". Entrepreneurs are encouraged in Libya and helped in their start up trials but there is customarily one aspect there which is unique: "They Are Not Allowed To Hire Anyone!! ..... "Everyone Involved in the Enterprise Must Be a Partner - Or Owner - of the Corporate Entity". Again the reality is somewhat more complicated but the Democratization of the Economy is again very much with the tide of History. Colonial Gaddafi said to me in off camera in informal conversation (in English) : "It Is Often Difficult Being Straight in a Crooked Crooked World" ! Indeed one telling moment in the taped "Conversations" (you could look it up - it's right there in the program) was when I made a statement: "That It Is Unfortunate That in The United States Everyone Is Asking For 'Jobs' When They Should Be Asking For Ownership" and he empathically answers "EXACTLY!!" To challenge "employment" as the Holy Grail seems outlandish to most in the Ruling Circles of the Modern Ancien Regime" - but when considering the increasing "input" to production by technology and particularly with impending Cyber additions to the pattern - questioning and challenging the proposition that all income distribution to the masses should be through "jobs" (which is the case with the vast majority of the World's population) may be destined to soon become a front and center issue of World debate in the time ahead. "Partners Not Wage Earners" might well become a real rallying call with deep political implications. Unfortunately there is little concern with this among the very well ensconced old order where all assets - again increasingly responsible for production - are so narrowly held by a small group who can control the entire society by their selection of compliant managers for their "Wholly Owned and Operated" Media Outlets" etc. Resting on long accepted practice they feel they are assured of an army of compliant "Wage Slaves" to manage and man their institutions as faithfully as the Loyal Royal retainers on Mediaeval feudal estates. Metaphorically they are as Gaddafi surmises "Industrial Age Serfs - Cotton Picking Slaves" - in a Dawning Age of Cybernetic Cotton Picking Machines - and everything else. Aristotle observed that the Slave conditions which applied in ancient Athens would be necessary - so that some could lead a civilized life of the mind and spirit - and would be remain necessary "unless and until the loom learned to weave." That age may be dawning and even at hand - and again Libya may be ahead of History's curve. Libya is very well positioned to play an extremely important modernizing role in the Middle East and the Islamic World where the United States has very likely become mired in a inappropriate disastrous extension of Military Power in what can only be seen by most of the World as an extension of traditional European Style Colonial rule. Besides threatening to exhaust the American National Treasury It has created a deep well of resentment among the World's growing hordes of Les Miserables reduced metaphorical and actually to attending to and manicuring the lawns within the gated communities - Castle Keeps - of their plutocratic overlords - much like their counter part serfs on the Feudal estates of the "good old days". Or the current system which insists on characterizing itself as the Model for the "End of History" - for the Ages as It were - while the poverty plagued masses of the World (over 50% live on less than $2.00 a day) are left to die of Aids and other easily preventable diseases. 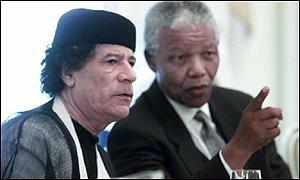 Gaddafi has won the whole hearted support of Nelson Mandela by taking a Progressive position concerning Africa with it's daunting problems which are all but being ignored by the "Established Powers" that be. He has had interesting communications with Fidel Castro, Hugo Chavez of Venezuela, Luiz Inácio Lula Da Silva Lula of Brazil and many of the Progressive elements of "World Public Opinion" which the New York Times characterized as "The Other World Super Power" aligned against the United States in it's Unilateral March to War in Iraq. It would seem that if there is any hope for the needed change which treats the Earth as United Whole System including the Masses and all within a proper ecological context - it will only come from the will of the people inspired by a vision of the means toward the Universal Justice and Practical efficiencies predicated on ideas truly relevant to the dawning new realities. Tax Cuts for the already wealthy will not serve - catering to the powerful alone is actually counter productive - for, in truth, the politically and economically powerful are sure to be a "lagging indicator" - the last to see - the wisdom and the means of doing the "Right Thing" which may now be possible for the whole of Planet Earth. There are other sources of course - but a big change is, as Bob Dylan sang, "Blowing in the Wind" - and Libya presents an interesting possible source worthy of study particularly for ideas which are neither Right Wing or Left Wing - neither Proletarian Marxist or Plutocratic Capitalist but grounded on ideas and principles which are able to subsume and ultimately accommodate both with comprehensively conceived understanding of the consequences of the crucial times in which we live and particularly within which all Humanity's progeny will hopeful prosper - "one and all." Democratic Ownership Economics - or even assumptions which could lead toward that direction - would represent a real Paradigm shift which the Old Order shows no real sign of contemplating. But as always it seems the new ideas never come in Societies which are heavily structured upon assumptions and institutions and habits of thought - of the outdated Paradigm. It was the "Loutish" America example which inspired Les Miserables of France and It may well be that the example of Libya might become a Model - which has the basic ideas and issues right - and in keeping with the times - and might inspire the Emerging Masses of the World including - in the end - the People of the United Sates and its allies to think anew the need for a just and Historically relevant future pathway out of the morass they so proudly proclaim as representing the "End of History?" Of course the bulk of "establishment thought' will pooh- pooh the notion of any need for fundamental change and will deride and scoff at any who attempt to question the basic legitimacy of the old order. But the mighty force of their propaganda machine need not restrain the thinking of people around the world - including the United States of America - whose leaders seem - to increasing numbers around the World - to be caught like a deer in the head lights - unable to comprehend the changes the times call for and can only flail about defending the old outmoded ways of Political, Economic and Social organization. This "Conversation" might help instill thinking about possible new ways of seeing the world - and it's necessarily liberating potential for a new order of things. For that reason you would be encouraged to view this brief and therefore inherently limited introduction to one system which challenges the whole proposition by which the world has been and is being run by a system of thought which can increasingly be seen as mired in an Historical "Ancien Regime" myopia!? Cable Television Systems in Manhattan, New York.